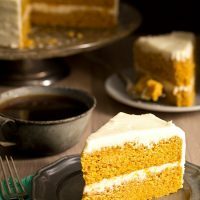 This two layer Pumpkin Layer Cake with Cream Cheese Frosting is made all from scratch and stays incredibly moist and flavorful, even a few days later. Already I’m hearing rumors and news stories about there being yet another pumpkin shortage this year. Every year it’s the same thing. Stock up on canned pumpkin now because it’ll be all gone. Then when it’s only a few days before Thanksgiving, surprise – you can still find canned pumpkin. Will the bad weather in the Midwest finally make this rumor come true? Or is it a marketing scheme to sell more pumpkin? Is someone out there crying wolf pumpkin again? I got most of my pumpkin recipes for the blog done, but I may pick up one more small can, just in case. If the shortage is true, maybe I can sell it on eBay for millions of dollars. People are usually pretty desperate for pumpkin, right? 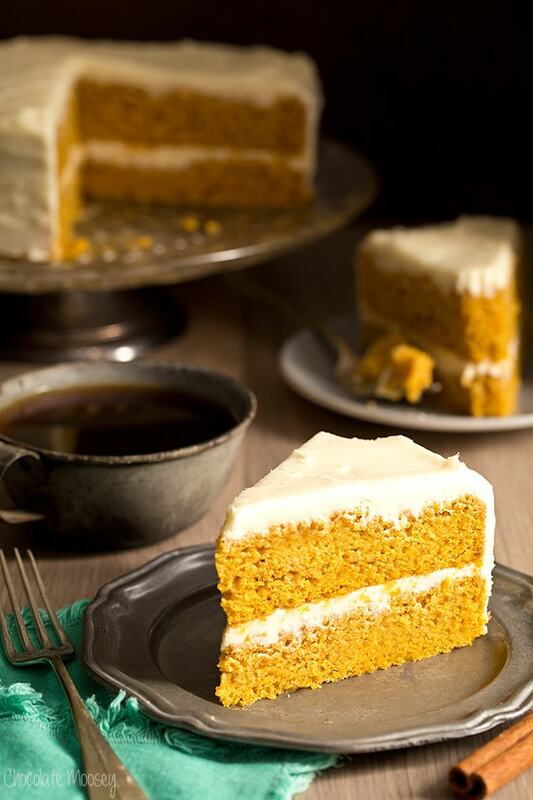 I’ve had the idea for this Pumpkin Layer Cake since last year, but the only time I eat pumpkin is between Labor Day and Thanksgiving, so I waited until now. It has nothing to do with staying on trend; my body simply does not want it. It’s like my pumpkin craving turns off on Black Friday and doesn’t turn back on until Labor Day. Then it’s game on for pumpkin. 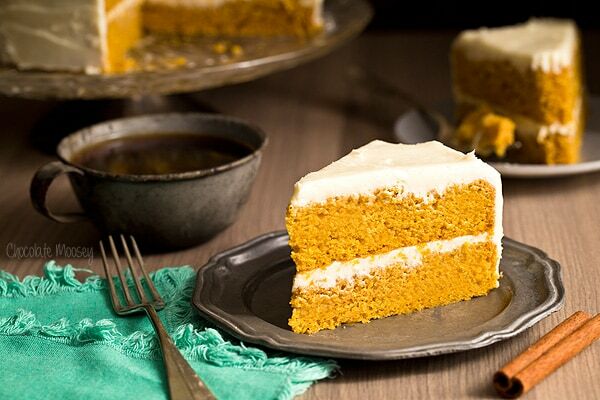 With all of the layer cake recipes I have, I can’t believe I haven’t done pumpkin yet. 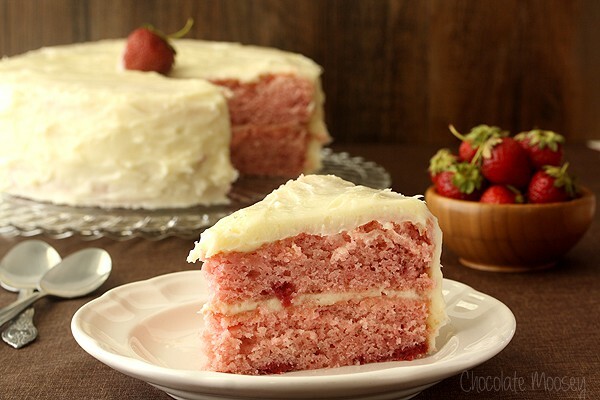 It’s moist and flavorful with thick cake layers and creamy frosting, all made from scratch. Sometimes you can’t mess with traditional pairings. It’s funny how sometimes simple is best. I thought about fussing with it – should I add nuts? Should I add a garnish? Should I drizzle it with caramel sauce? Should I add another flavor to the cream cheese frosting? Nope. It was perfect the way it is, simple and all. I did try a new-to-me kitchen hack in order to get flat layers without having to trim. I made homemade bake even strips where you wrap a wet (but not soaking) strip of towel around the cake pan. The wet towel cools down the outside of the cake so it bakes more evenly and the top stays flat. Except it didn’t work. I think it helped but I still had to trim a bit. Maybe I didn’t spread the batter evenly enough in the pan to begin with. I read somewhere that maybe my batter was too thick. I’ll keep trying with future cakes, but if you have tips on getting flat cake layers, I’d love to hear them! Preheat oven to 350F. Line the bottom of two 8-inch round cake pans (1 1/2 inches deep) with parchment paper then lightly grease with cooking spray. In a large bowl, sift together the flour, baking powder and baking soda (do not skip this step). Stir in the cinnamon, nutmeg, and salt. In a large mixing bowl, beat together on medium speed the oil, sugar, and brown sugar until combined. Beat in the eggs, one at a time, until smooth. 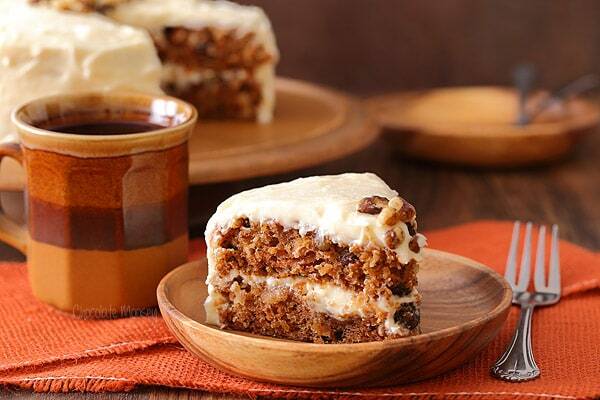 Beat in the pumpkin and vanilla. Add the flour mixture alternately with the milk, adding the flour in 3 additions and the milk in 2 additions (begin and end with dry ingredients). Divide the batter between the two cake pans and bake 30-35 minutes or until a toothpick inserted in the center comes out clean. Cool for 15 minutes then invert the cake pans. Cool completely on a wire rack. If the cake layers are not flat, trim some of the cake off of the top until flat. 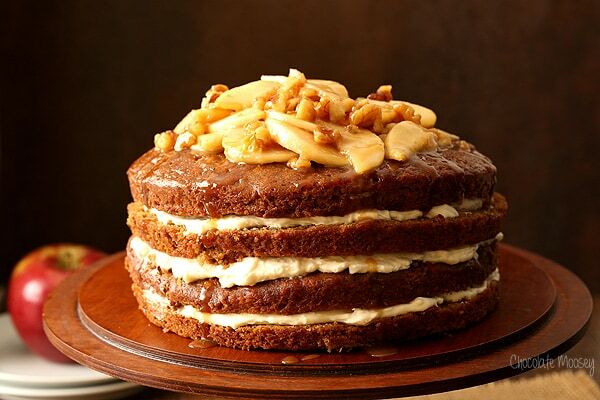 Place one cake layer on a cake stand or plate. Slide pieces of parchment or wax paper underneath the cake for easy clean up later. Spread some of the frosting on top of the cake for the filling. Top with the remaining cake layer. 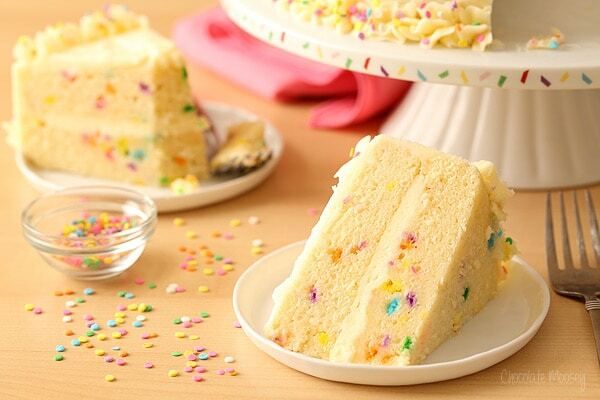 Spread a thin layer of frosting all over the cake, sealing in the crumbs (don't use more than half of the frosting). Refrigerate 15 minutes. Finish covering the cake with the remaining frosting. Carefully remove the paper pieces. Refrigerate until the frosting is firm. Store the cake covered in the refrigerator. For best results, let the cake sit at room temperature 15-30 minutes before serving. I don’t think it is true about a pumpkin shortage. I bought very big decorative pumpkins here in Chicago for only $2.99. And EVERY PLACE seems to have an abundance of them. BUT since my love of pumpkin items does NOT shut down after Thanksgiving, I will buy a couple of cans to be ,like you, on the safe side. Aldi has them for $.89. I agree – I haven’t noticed any shortage of pumpkin on my end, but I did have one or two people who live in other states say they had trouble finding cans. Who knows? :) Good to know about ALDI – I’m overdue for shopping there anyway. My cousin swears by turning any domed cakes upside down as they cool, but I’ve tried that, and it does not work for me. I think your cake looks perfect as-is, and I’d love a slice myself! Oh interesting! Maybe it helps flatten as it cools? I think the bake even strips did make it easier for me to level the cake as the edges were flat but the middle was not. Part of me thinks it might be the recipe itself, so I’ll have to try it on other cake recipes I have. I find absolutely nothing boring about this cake! Also I think I am similar to you because I fought the pumpkin craze until about 2 weeks ago with hoards of apples. Now I will pumpkin lots of things until Thanksgiving and then be done with it haha. Have you tried Wilton Bake-Even Strips? Not officially! When I heard about them, someone said she made them homemade with a dish towel. Have you tried them? Do they work? In my experience, they do! 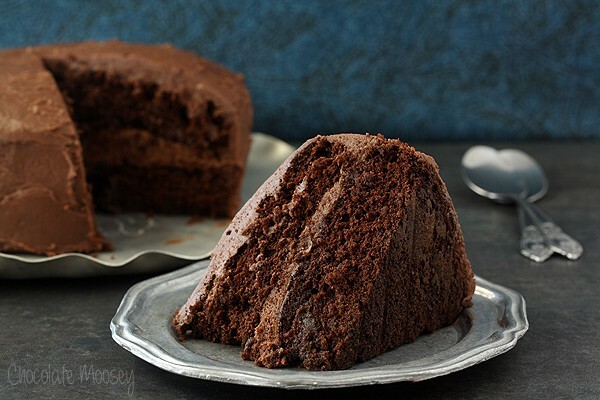 This cake is so perfect in it’s simplicity! I’m glad you didn’t add anything else. 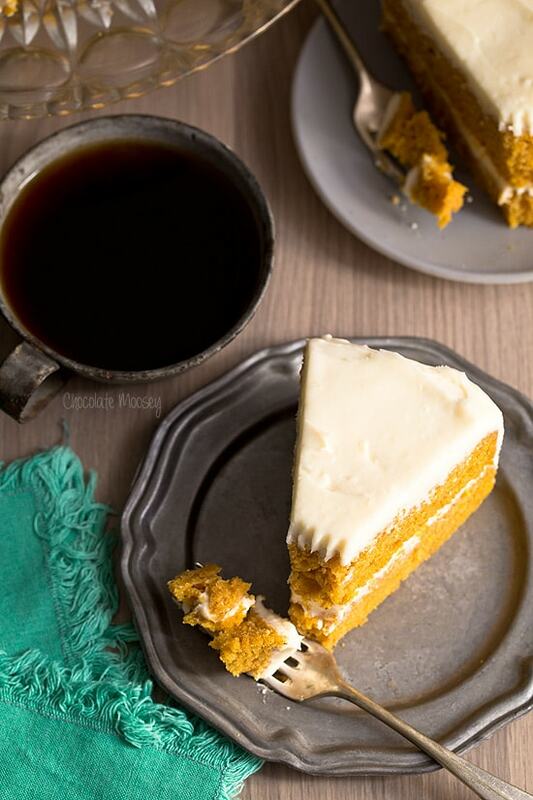 Pumpkin cake and cream cheese frosting are the perfect pair. What effect would it have to substitute stick margarine for the unsalted butter. My husband has a problem with butter. Margarine and butter have different tastes and water content. Since you’d be using it for the frosting where it’s unbaked, it’ll affect the flavor. The water content could also affect its texture and whether it’ll be firm enough. I don’t use margarine, so I’m not sure how it’ll work out. Let me know if you try it!